Cebu Pacific invites you to visit two of the most relevant places in East Asia as it dishes out discounted flights to Osaka and Seoul. 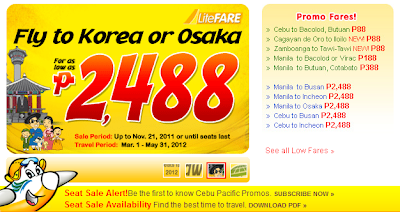 For just Php 2488, you can “Fly to Korea or Osaka” with travel period inclusive of March 1, 2012 to May 31, 2012. This promo is best for early planners out there, the sale features flight to major cities of Korea which includes Busan and Incheon; plus flight to Osaka is also in the list. Check details below for clearer info. Promo is up until November 21, 2011 or until seats last.